While examining a report published by the Avon and Somerset S camera partnership, we noticed that they may have vital road safety information of national significance. After emailing the partnership (request refused) we decided to ask the Chief Constable direct. My organisation campaigns for traditional road safety based on skills, consideration and responsibility. We campaign against excessive speed limit enforcement, because we believe it makes the roads more dangerous. I found a document on the Avon and Somerset Safety Camera Partnership web site that mentions Avon and Somerset accident causation codes. It appears that (perhaps uniquely in the UK) Avon and Somerset gather accident causation codes separately for “inappropriate speed” and “speed in excess of a speed limit”. Since it appears from Canadian research that something like two thirds of “excessive speed accidents” take place entirely within the prevailing speed limit, it should be obvious that some of the figures widely quoted for possible accident reductions available from speed limit enforcement should be discounted by perhaps two thirds. I very much wish to examine Avon and Somerset accident causation data to confirm or deny that the approximate two thirds proportion applies on at least some UK roads. I'm perfectly happy with the politeness of their response, but I am appalled and concerned about the apparent efforts of the DfT to control the availability of basic road safety information. I am left wondering what they think they have to hide. Can you please provide me urgently with the basic breakdown of Avon and Somerset accident contributory factor information for 2001? It would greatly assist our efforts to uncover the truth in road safety. Thank you for your letter of the 1st October concerning the response you have received from the Avon and Somerset Safety Camera Partnership. 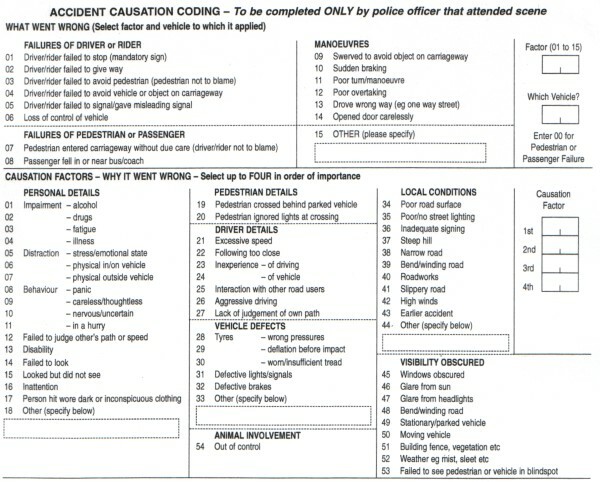 In common with all police forces officers who attend the scene of a fatal or personal injury road collision are obliged to complete a statistical return (Stats 19) for the Department of Transport. 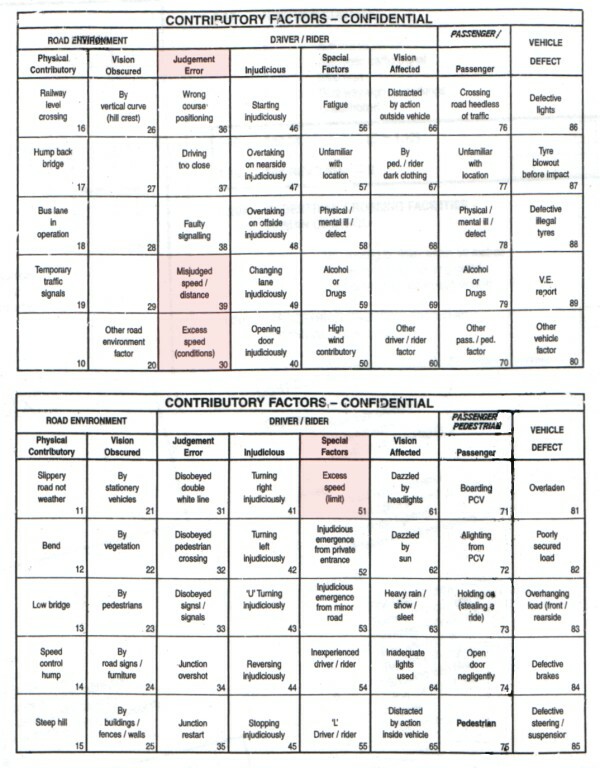 The content of Stats 19 is subject to period review and change by the Department of Transport. Although the police are responsible for collecting the data we are not responsible for it’s collation and final publication. Once collected it is passed to the consortium of local authorities that make up the Avon and Somerset force area for verification, electronic inputting and subsequent transmission to the Department of Transport who, in conjunction with the National Statistics Office, publish annual reports on Road Casualties in Great Britain. I enclose for your information a copy of the Stats 19 form that was in use up to 2002 and a copy of that which is currently in use. You will note that the speed related causational factors have been changed in the latter example. My own unit uses Stats 19 data as a component that informs intelligence led policing, targeting police activity in the vicinity of collision hotspots. It is used by local authorities, their road safety officers and highways units, to influence local road safety initiatives and road re-engineering decisions. It is used by safety camera partnerships, working to Department of Transport criteria, when developing their annual operational case for fixed and mobile camera sites that has to be agreed by the Department. The precise manner in which Stats 19 data is used by the Avon and Somerset Safety Camera Partnership is something I consider they should answer and I intend to write separately to Mr Farrow advising him of the police view on that.
? The formation of the Safety Camera Partnership in April 2002 has not contributed to a reduction in officers committed to Roads Policing which is 230 officers, in fact the opposite is true. The four police officer posts that were previously assigned to speed enforcement were freed up to concentrate on the broader aspects of Roads Policing and are now used to tackle road crime in conjunction with Automatic Number Plate Reader (ANPR) technology focusing on the criminal use of vehicles and those who drive without documentation. On the issue of speed our officers’ focus is very much on protecting vulnerable roads users in built up areas, driver education and addressing the quality of life in rural communities where residents perception of a speeding problem through villages if of major concern to them, often higher up the local agenda than the fear of crime. Patrolling officers exercise discretion in the enforcement of speed limits. Enforcement is only considered at speeds in excess of the Association of Chief Police Officers (ACPO) threshold of the speed limit plus 10% plus 2 mph. With the exception of the higher end urban speeders, of more than 15 mph above the posted speed limit, any urban speeder justifying prosecution is given one opportunity to attend an educational seminar as an alternative to prosecution and endorsement. All of the residual income from the educational seminar is handed over to a charity; Lifeskills, who deliver a broad base of safety education to primary school children in the region. Conceptually this Constabulary is fully supportive of the work of the Safety Camera Partnership but it is has not been without media notice that we have been outspoken with our concerns on the ethics of some operational deployments in their foundation period. Those are historic in context and a way ahead has been debated. A programme of adjustments has been agreed and will be fully implemented in time to coincide with the revised Department for Transport operational case period that will commence April 1st 2004. I suspect that the ‘Safe Speed’ opinion of safety cameras will always remain polarised to my own and we will have to respect each others views on that subject. I believe that safety cameras play an integral and essential part of a holistic road safety strategy. We are not complacent but in the first year of operation of the Avon and Somerset Camera Partnership, in comparison to the previous years figures, road death was down 15% and personal injury down 4.5%. If we can continue with our holistic push to make the roads safer then we have a real chance of meeting the challenging year 2010 casualty reduction targets of the Department for Transport and many more families will continue to enjoy each others love and company in good health for many years. Many many thanks for your interesting letter dated 6th October. I also very much appreciate that you took the trouble to also provide the letter in electronic form. Thank you. I feel confident that you understand the figures that I would like to see, and I fully expect that you will not need to carry out any further analysis in order to provide them. However, for clarity and convenience, I shall spell out my interests precisely. I note with very considerable interest that your 2001 coding forms also include a box for “emergency or stolen vehicle involved”. I wonder if you have already carried out analysis to see the number of accidents involving excessive speed that also involved stolen vehicles or emergency vehicles. If there is any analysis, I would be eternally grateful if you could please advise me of the findings. Thank you for your assistance. I look forward to hearing from you. Yes, thank you we have received the cheque. Lawrie is away on annual leave this week, but our analyst is aware and is undertaking the work. I have spoken to her and she anticipates it will be ready in 10 to 14 days - possibly sooner, depending on her work load/other overtime commitments. She will be able to provide the data on an Excel 97 spreadsheet, as requested by you.